Paton Ashbrook, Robert David Grant and Ari Brand in The Lucky One. Photo by Richard Termine. BOTTOM LINE: The gifted Mint Theater unearths a rich drama by Winnie the Pooh creator A.A. Milne about the fractured relationship between two brothers. Millions might recognize A.A. Milne as the author of Winnie the Pooh; what many don’t know is that Milne was a prolific and successful writer (two dozen plays and ten novels) in the first half of the twentieth century. When he died 60 years ago, most of his work was out of print. 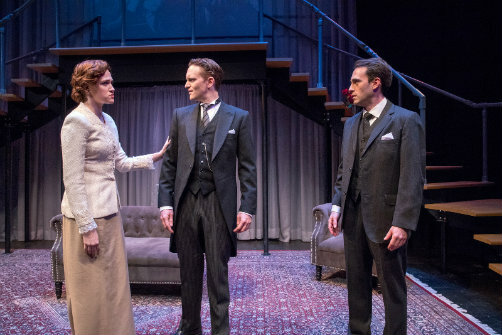 The Mint Theater, whose credo is “Lost Plays Found Here,” has been doing productions of Milne’s plays for the last two decades, and is one of the troupes helping audiences to rediscover him. The theme of The Lucky One is familiar, one as old as the Bible. Gerald (Robert David Grant) is the beloved golden (and literally blonde) child of the aristocratic Farringdon family. Everything comes easily to Gerald, whether it’s a respectable post in the foreign office, the goodwill of their parents, or winning the affections of his fiancée Pamela (Paton Ashbrook). His elder brother, dark-haired Bob (Ari Brand), has been shipped off to seethe in the city, unsuited to the business world. “Poor Bob”, as he’s referred to, is most embittered over his belief that Gerald has stolen Pamela, whom he loved, unbeknownst to anyone. The only member of the family who prefers Bob is great-aunt Harriett (Cynthia Harris), who exchanges cutting banter with Gerald (“Gerald expects everyone to love him and they do”) but reserves her sympathy and offers of help for Bob, which he inexplicably refuses. Bob is in a serious mess—his business partner has done something illegal and run off, leaving Bob to clean it up. There’s talk of prison, so Bob implores Gerald to return with him to London, although Gerald, thinking prison would be like a holiday where one could learn French, is unfazed by the sword hanging over his brother's head. As Bob’s fate hangs in the balance, so does Pamela’s, as her concern for Bob begins to trump her love for Gerald. The brothers have a long overdue confrontation, and fortunes for all three will shift by the final act. As Gerald, Grant has the harder brother to play—Gerald is as closed as Bob is an open, inflamed wound. Gerald is largely a cipher, and doesn’t argue when Harriet matter-of-factly tells him he’s never shown his heart. Gerald often makes remarks about Bob that are insensitive, but Grant shades with pathos a role that could have come across as just glib. There’s a locked-away complexity to Gerald, although we only get a glimpse during the final showdown. As Bob, Brand is very affecting as the brooding, resentful brother with a colossal chip on his shoulder, one that is justified, although not as much as he imagines. Brand makes palpable Bob’s desperation for someone to listen and care just for him. But the MVP is Cynthia Harris, who is perhaps best known for playing Paul Reiser’s mother on Mad About You. Aunt Harriett has the best lines and Harris, clearly enjoying herself, uses lacerating wit to great effect. But she also conveys compassion for both nephews as their situations change. The Lucky One features a sprawling cast of eleven, with a nanny and a couple of family friends in the mix. Some only get a scene or two, but there isn’t an off note among them. Jesse Marchese has paced the three acts well. Except for the end of the third act, the scenes flow without feeling rushed. Although no fault of the funny and engaging Andrew Fallaize and Mia Hutchinson-Shaw as the comic relief golf lovers Tommy and Letty, I could have done with less of the golf material, especially near the beginning. But the early twentieth-century period costumes and sets by Martha Hally and Vicki R. Davis, respectively, look great. Milne’s play is not without flaws—It’s never clear, for example, why Bob was cast aside and why the family clearly loves Gerald more. But the Mint Theater shores up their reputation with another solid production, giving audiences an opportunity to see a beloved author in an entirely different light. The Lucky One is by A.A. Milne. Directed by Jesse Marchese. Set Design is by Vicki R. Davis. Lighting Design is by Christian DeAngelis. Sound Design is by Toby Algya. Costume Design is by Martha Hally. Wigs and Hair is by Robert-Charles Vallance. Stage Manager is Jeff Meyers. The cast is Paton Ashbrook, Ari Brand, Andrew Fallaize, Michael Frederic, Robert David Grant, Wynn Harmon, Cynthis Harris, Deanne Lorette, Peggy J. Scott and Mia Hutchinson-Shaw.